The series is open to all Almost Athletes members, and consists of 12 local races of various distances throughout the year. You must do at least 3 races to qualify, and the best 7 results count. See below for full details. 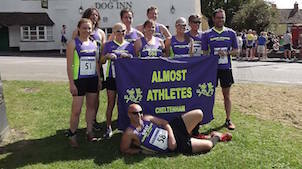 Races preceded by * have also been provisionally chosen to be part of the Gloucestershire AAA road race series. Footnote: Every competitive member should receive a 'card' from England Athletics with your EA number. If you have been a first claim, AA competitive member for more than 3 months and not received it, please contact the AA membership secretary, Alison via membership@almostathletes.co.uk. You may need your EA number to enter some races at the reduced fee.